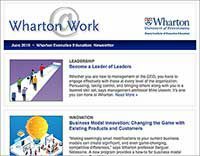 Wharton MBA and EMBA alumni, from the Class of 2010 forward, are eligible to attend one Executive Education open-enrollment program at no charge. You must be an MBA or EMBA graduate of the Class of 2010 or later. You may enroll in one Executive Education program from the list of eligible programs, once every seven years starting July 1, 2017. The program must be taken within a seven-year period from the year of graduation. For instance, graduates of the Class of 2010 are eligible to take one program between July 1, 2017 – June 30, 2024. As of July 1, 2024, a new seven-year program cycle begins. The program must be taken by the registered alumnus/alumna and is not transferrable. Eligible open-enrollment programs must be six (6) days or less, held in Philadelphia, San Francisco, or Beijing. This benefit extends to tuition only. Lodging is not included and must be covered by the participant. Wharton Client Relations can assist in recommending accommodations. Alumni enrollment will be capped at three (3) alumni per program, per run date. Program enrollment is on a first-come, first-served basis. 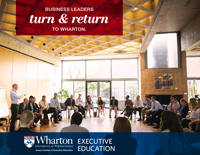 If a program in which you are interested is at maximum capacity for alumni, Wharton Client Relations will assist you in selecting another program. A cancellation fee of $500 will be incurred for cancellations occurring four weeks or less from the start date of the program.